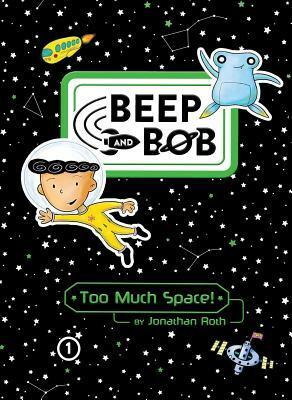 Meet space-school attendee Bob and his alien bestie Beep in this start to an outrageously funny and action-packed chapter book series that's great for "kids who love funny stories but may be too young for books like -Diary of a Wimpy Kid" (School Library Journal) from debut author Jonathan Roth! Astro Elementary is a school near Saturn attended by the bravest, brightest, most elite kids in the galaxy...and Bob. Bob never wanted to go to fourth grade in dark, dangerous space. He even tried to fail the admissions test by bubbling in "C" for every answer--and turned out to be the only kid on Earth to get a perfect score! Bob feels he couldn't be more misplaced at his school--until he meets Beep. Beep is an alien from the planet Orth who was kicked off his home world for being too small. The instant Bob finds him, Beep adopts Bob as his new mother. Soon Bob can't turn around without bumping into Beep's squishy little body. Together, they make the perfect team. And Bob logs their adventures on his space blog, or SPLOG, with Beep providing the illustrations. In their first adventure, Bob is humiliated on a field trip to Pluto when his tongue gets stuck to the ice. Not even Beep can keep Bob from becoming the laughing stock of the school. Bob has to find a way to completely change his personality, just in time for their next treacherous field trip--to the gaping mouth of a super massive black hole!